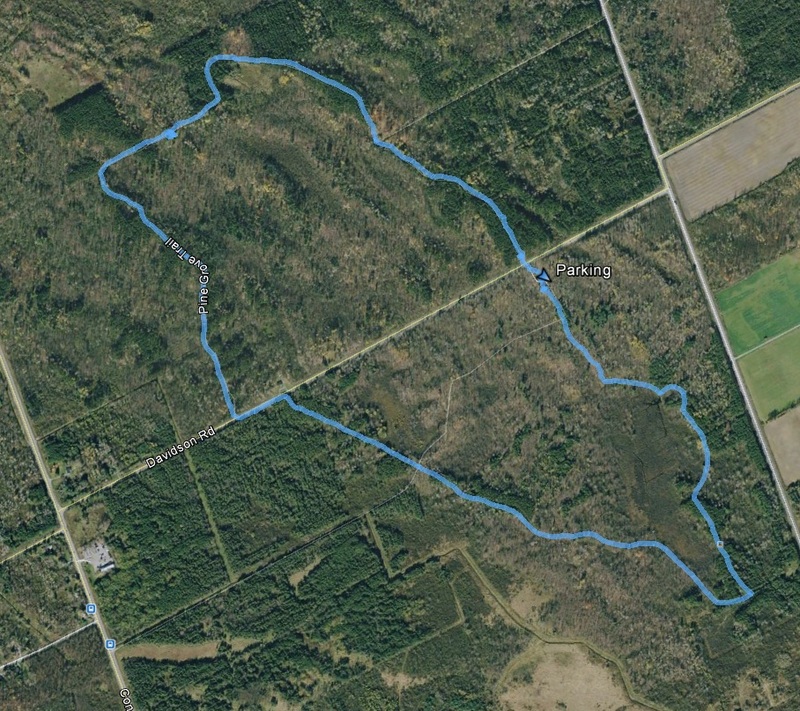 Located in South Ottawa, Pine Grove Trail is part of the National Capital Commission (NCC) Greenbelt trial system. Parking can be found off Davidson Road at P18 (N45 21.292 W075 35.560) which is between Hawthorne Road and Conroy Road. The hike is a 5 kilometer loop through natural forests, reclaimed white and red pine forests and marshlands. It should take between 60 and 90 minutes to complete following trails 43 and 44. Starting at the parking lot head north and cross Davidson Road to the beginning of the trail, here you'll see an information panel explaining the history or the forest. Before 1962, most of this area was cleared farmland. After it was purchased by the NCC both red and white pines were planted in most of the clearings and the area was eventually developed into a full grown forest. Heading north on 43, the first kilometer of the trail is a gravel covered. This is part of the Greenbelt pathway which will eventually run from Greens Creek in the east end of Ottawa to the Shirley's Bay in the west. As you walk make sure you take a few moments and read the panels which describe the different trees in the forest. One of the best parts of this trail are the new signs that are located at all intersections. As the gravel path heads east continue on 43 (to the north) to where it changes into a grass/dirt covering. As you follow the trail you'll eventually pass by a large marsh on your left. There are a few spots where you can sneak through the brush get a better look but beware, the closer you get the more mosquitos you'll anger. After another five minutes you'll arrive at another intersection, turn left and keep going on 43. Keep heading south through the old natural forest until you reach Davidson Road. From here you have two options... 1. You could cross the road go over a small bridge onto a narrow, not well maintained trail, or... 2. Go left and follow the road for about 100 meters until you reach the opening on the left. Personally, I chose the road... it was a nice break from the bugs. From here the trail keeps heading south. If you're getting tired you have the option of cutting the hike short. At the intersection of trail 43 and 44, if you turn left you will reach the parking lot after only a few minutes. If you're still up for the hike go straight through onto trail 44. This part of the walk brings you around a very large marsh with a few boardwalks, some gerat views and lots of mosquitos. The trail follows a southern flow for a kilometer until you make it around the marsh then it heads straight north towards the parking lot. Along this stretch there are a lot of side trails which will take you to side street parking on Hawethorne Road as well as other parts of the Pine Grove Trail System. Stay on 44 as this is the only one that leads you back to P18. In conclusion, Pine Grove Trail is a great hike for beginners and families. It offers some very easy terrain, some nice scenery and is by far one of the best kids in the Ottawa Green Belt.